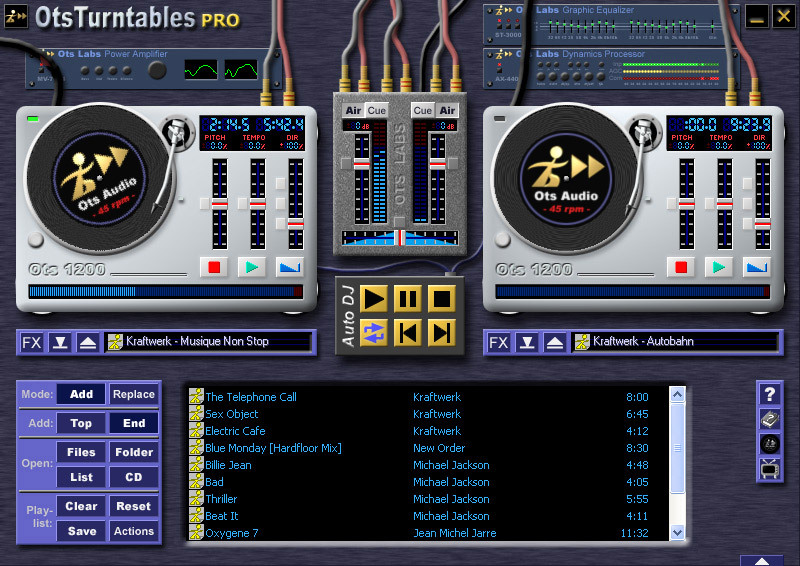 The hottest MP3 mixer on the planet for music lovers, aspiring DJs & pros. "a solid player for both newbies and laptop DJs"
OtsTurntables Free is a 100% FREE (no spyware, no banner ads), virtual set of professional mixing turntables empowering music lovers, aspiring DJs and pros to scratch, adjust tempo and pitch, play backwards, and mix MP3s, WAVs, Ots files and CDs. DJ your next party like a pro, or just enjoy listening to your MP3s mixed professionally at home with Auto DJ. You'll love the optional warm vinyl-crackle ambience, and the built-in Dynamics Processor will save you juggling that volume knob ever again. You can also upgrade to the Pro edition allowing you to record your mixes, cue in your headphones, webcast to the world, and enjoy psychedelic visualisations.